The following example shows that a sort indicator can be inherited using the GETSORT option with the APPEND statement. Create a "shell" data set that contains no observations. Create another data set with the same structure, but with many observations. Sort the data set. 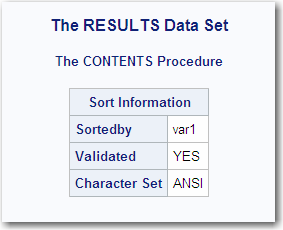 This example shows sort indicators using the SORTEDBY data set option and the SORT procedure. 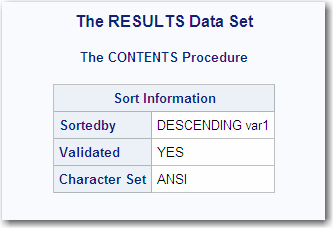 A sort indicator is being created using the SORTEDBY data set option. 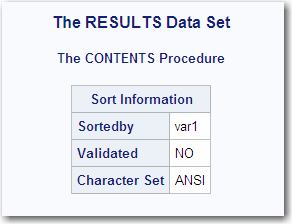 This example shows the sort indicator information using the SORT procedure.